Question: Do you know of another way the triumphs after passing through purgatory? Respueta: Otherwise no, but as the years go by more and more each win you value. You do not know when it begins and when it ends. When things like that have happened this past year as you see that the options are ending. In other words, you have to enjoy every moment, appreciate what is happening to me, which is very positive since I've returned to play. In this case I have to thank everyone who is helping me every day, people who supported me during all these months have been complicated. Thanks to all those messages of support I have received for days when you personally go training costs because you do not see immediate results, as you because in the end if you do not do for you what you do for all these people who are supporting you. Q: Was there at some time when you said, "this is over"? A: "This is just" no, but when you're seven or eight months without playing, going to work every day and do not see improvements because one has his doubts. No human would not have doubts and I still have, but hey, we work every day what we can to try to be as long as we can for the circuit being competitive everything we can because being here is fantastic news. I like. I enjoy it and hopefully we can be around for many more years. Q: The knee is better, right? A: The knee will days but obviously is allowing me to compete against all guarantees to be fighting for everything I've competed until today and that brings joy undoubtedly. Q: Does it hurt your knee now? A: While sitting does not hurt but when I play. Although difficult to answer those questions because since I returned I have excellent results from the point of view resultadista pure, but yes, there are many days knee still bothering me, but so far it is preventing me from competing, which is the most important . The truth is simply be competing in tournaments as important as here in Barcelona Motecarlo, in Indian Wells and makes me happy that I am. Q: What do you think about the comeback of Real Madrid? A: I trust. I hope so. We have to take things, but wish we leave the party of the year and we can trace. We will be where we are and forces next week, happy to be competing again in Madrid. It's a very special tournament for me and for all Spanish. I have had great experiences there and just being able to jump and play in that stadium, yet the public is something special and here again I am very excited to feel. Q: I really like the end of the tennis matches, so different from football. A: They are different worlds. Football is a contact sport, other than tennis. Q: But is that respect and education, as today Almagro, who said: "I have won the best ever and against that you can not fight". A: It's a matter of respect and courtesy. Tennis is an individual sport and we know we can win, lose and when we hand it's all over. Do not forget that it is just a game and there are other things ahead. Q: Roland Garros is the goal, right? A: The goal is to Madrid now. Roland Garros is there, but the goal is Madrid, after Rome and we will every day. In fact the aim is next workout. Let every day, that is the way things have worked for me and try to be increasingly stronger, better prepared and hopefully we can come to Madrid with a good feeling. R: Morning break. I have spent many days in a row. I've been a month without rest for a day and rest and tomorrow and will train on Tuesday. Q: On Tuesday, you will come to Madrid to watch the game, right? 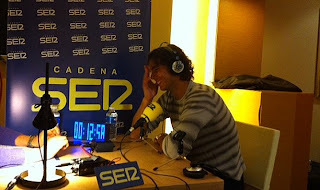 A: No, on Tuesday I stay in Mallorca training, after Madrid game in Rome and I will be supporting from home. Unfortunately I can not be there. Q: After Ronald Garros will be when you start earning points because like last year did not play anything. A: Well recover no, I'm adding each day. Every match I win is added. It is not a matter of defending or anything, is a topic to see how you go during the year. I started a month later than everyone else and still am now located the second race of the year and this is the ranking that I looked at today. That is the most positive and all the games I'm winning sum. The other is the brand ranking ranking which is currently but having been seven or eight months without competing because not choose to be higher today. The ranking I have to look at is the race that is when we started since January, all with zero points.